Dr. Puthucheary expressed scepticism regarding the breathless predictions of our lives changing beyond recognition and the imminent singularity. 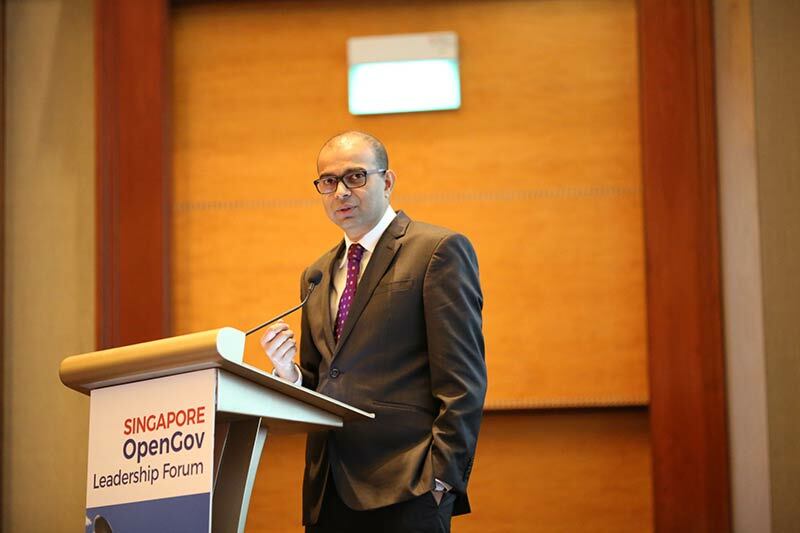 Senior Minister of State (SMS) for the Ministry of Communications and Information and Ministry of Education, Dr. Janil Puthucheary delivered a keynote address on building capabilities and platforms for a Smart Nation at the 3rd Annual Singapore OpenGov Leadership Forum on May 18. He talked about the roles of the government, corporates and citizens and the importance of a cross-cutting approach in realising the Smart Nation vision in his though-provoking speech. Dr. Puthucheary expressed scepticism regarding the breathless predictions of our lives changing beyond recognition and the imminent singularity. However, technological disruption is very much real. He said that technology provides an opportunity to rethink the fundamentals, what the role of government is in this time, and how the public sector can be transformed. Technology gives an impetus to review decisions and processes, to expand the solution space, to extend the possibilities and look at problems which were previously considered intractable, because the trade-offs were thought to be unacceptable. Disruption is nothing new for Singapore. The city-state has been dealing with disruption for the 52 years of its existence, disruption from the forces of globalisation and the opportunities and threats posed by the need to be an open economy and an open nation. And the Singapore government has kept its word and delivered. It’s never been about the application of one big idea or technology. It is about making the entire system work, by delivering a little bit more than what was expected, by investing in people and ensuring that there is excellence at every stage. And that has not changed even today. The roles of the various stakeholders need a re-think to align with technological change and its impact on the global and national society and economy. Striking the right balance is critical. For instance, the right balance is required is between the roles of the public sector and the private sector. Dr. Puthucheary said, “Wherever possible, we have to take the stance that the private sector has a big role to play.” The private sector is great at taking risks and disrupting and there are certain areas which are best left to them. Private enterprises need to have the opportunity to seek profit, innovate in those areas and create jobs. But where a public good is not being served or the solution or enabler is absolutely central to the development and operation of the ecosystem, the government might need to step in and be the driver of innovation. Hence, the government cannot be merely an informed consumer of products and services, though it does need to be that in certain contexts. At times, it needs to be a lead commissioning agent, collaborating with the private sector, seeding ideas and leading demand. At others, it might even need to build the solutions for which it needs to have in-house engineering expertise. And the solutions have to be built in such a way that the private sector can then layer its own business models and operating systems on top of the government-built infrastructure. For Singapore, that in-house engineering capability is provided by the Government Technology Agency of Singapore (GovTech), which is a part of the recently formed Smart Nation and Digital Government Group (SNDGG)1. GovTech works not just with SNDGG but with the government as a whole. Its offices are seeded throughout various ministries and agencies, implementing many of their strategies. Even within the government, the right balance is required between centrally planned and implemented policies and what the ministries, agencies and statutory bodies, as well as the bodies that are one or two steps removed from direct government control and funding are doing. “Give them space to innovate within the public sector, give them space to have fluidity of ideas and labour. At the same time have that central assurance,” Dr. Puthucheary said. Another area where balance is critical is between regulation and allowing space for innovation. Regulation is essential for ensuring the safety of citizens and providing clarity for businesses. At the same time, excessive regulation may constrict the space for innovation. Moreover, legislative change is often unable to keep up with the pace of technological disruption. Regulation if approached the right way can help drive innovation. The SNDGG is looking at the regulatory landscape, identify processes which are a hindrance to innovation and disentangle those knots, so as to drive transformation, catalyse more collaboration and open sharing of information. The government also has to consider the policy implications of issues like data collection and analytics, for people who collect the data, for those who analyse the data and then the people who then provide that information. For instance, a traditional hospital develops an algorithm that makes accurate predictions about a person’s mortality and lifespan, with and without exercise or say change of diet. What would be the impact of this prediction on the person’s ability to get insurance. Should that data be made available to the insurance company? What does the responsibility of the hospital and the clinician entail? It comes down to getting all the little things lined up in a row, the human elements, the software elements, the process elements. That will happen only when there is a whole of systems approach. Dr. Puthucheary gave a couple of examples of this approach at work. One is the National Trade Platform (NTP). Built through a collaboration between Singapore Customs and GovTech, NTP aims to provide a business-to-business (B2B) and business-to-government (B2G) digital exchange, enabling seamless, paperless flow of information. NTP is an open platform allowing developers to layer their own B2B or B2G or even business-to-consumer products. Another example which demonstrates a cross-cutting, whole-of-government approach is the ePlanner platform developed the by the Urban Redevelopment Authority (URA). It is a one-stop, geospatial urban planning analytics tool developed in-house by URA. It integrates data from 25 agencies to enable advanced spatial visualisation and analytics. Land is one of the scarcest resources in Singapore and having this sort of integrated approach is crucial for successful urban planning. All this has to tie in to a whole-of-nation approach. The Smart Nation journey has to be inclusive from the point of view of every single citizen, every single government agency and every single company. Singaporeans who did not have exposure to technology, must be afforded the chance to reskill or upgrade their skills, as is being done through the SkillsFuture movement. Small and medium enterprises who are so small that they find it difficult to digitise have to be assisted to enable them to take advantage of the online platforms and services that are available today. “No one can be left behind. We must not accept that it is alright for some to succeed, for some to fall behind. The Smart Nation journey has to be whole-of-society and whole-of-nation,” Dr. Puthucheary concluded. 1 The Smart Nation and Digital Government Office (SNDGO) has been established under the Prime Minister’s Office (PMO), bringing together staff from the Digital Government Directorate of the Ministry of Finance (MOF), the Government Technology Policy department in the Ministry of Communications and Information (MCI), and the Smart Nation Programme Office (SNPO) in the PMO. GovTech, previously a statutory body under MCI, has been placed under the PMO. The SNDGO and GovTech together form SNDGG.Dr. Janil Puthucheary was appointed as the Minister-in-charge of GovTech.